A few years ago, I decided to try something new and create a podcast that would share the message that “financial planning had failed” and that Prosperity Economics provided a better alternative. I wanted a platform to educate those ready for a fresh approach to building wealth as well as a way to serve my clients at Partners for Prosperity. It’s the 2 year anniversary of The Prosperity Podcast and I couldn’t be more pleased to have decided to take the plunge into the podcasting arena! It has helped me serve my clients at a higher level and a podcast just might help you do the same for your clients. Podcasting has fast become one of the most popular and effective forms of content marketing in recent years. And there are some exceptionally good reasons for this. In fact, there may be strong enough benefits to lure you into utilizing this amazing platform (if you aren’t already). Well, it’s true that you should go into this with a reasonable level of commitment. It’s also true that you should expect some expenses and the allocation of some of your time. However, the benefits can far outweigh the “costs.” Plus, I am going to share with you some “shortcuts” that will help you reap the rewards without all of the complications. 2) A podcast positions you as the recognized expert and trusted authority. The listener chose to subscribe to your podcast. They have already shown interest in what you can offer them. Now, when they plug your podcast into their car or pop in their ear buds you have their undivided attention! Think about that. You have the ability to educate, share, entertain and establish the knowledge and value that you bring to them. 3) A podcast is the next best thing to being there live. Most of us would agree that there are few scenarios better than being eye-to-eye with our clients and prospects. Holding a microphone and speaking to a group is great as well. Now imagine thousands of people hearing your voice just like you’re in the room with them! Your clients will love the familiarity and your prospects will get to know you (before they even meet you) in a way that cannot be achieved through the written word. 4) A podcast is a convenient, automatic way to reach out to your audience. You can record your podcast in your PJ’s at your home office if you choose. You decide how often you want to produce episodes and what the content will be about. Your listeners have chosen to listen to you. What a fantastic way to deliver value while keeping your services top-of mind! Also, remember that podcasts are automated. Your listeners subscribe to your feed and have your podcast episodes delivered directly to the device of their choosing. They do not need to remember to go back to your site and they do not need to manually download it and transfer it to an MP3 player. It happens automatically, like magic! 5) A podcast creates a new level of value and customer support. Do you wish you had more time to answer questions that your clients have? Wouldn’t it be great if you could explain the benefits of your services in a way that answers most of your prospects unanswered questions before they even meet or call you? Your own podcast is a spectacular platform that allows you to keep your level of support up while potentially keeping “review time” down! Your listeners will feel taken care of. You can certainly create your own podcast from scratch. Many business owners do this and end up with some great results. With a decent quality microphone, an audio editing application like Audacity and a plan that serves your prospects and clients, you can be on your way. However, like most things, it’s probably not quite as easy as first glance. While giving all of the specific steps of starting your own podcast is beyond the scope of this particular article, my Prosperity Podcast co-host Todd Strobel and I share some great tips on how to get started in this special 22 minute mini-training. If you still aren’t sure you want to strike out on your own, here are a few “shortcuts” you might consider. 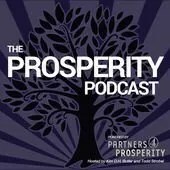 1) My co-host on The Prosperity Podcast, Todd Strobel is known as the “NO BS Money Guy.” He has an extensive background in Prosperity Economics as well as great interviewing skills. Todd can co-host a podcast with you too! This takes a lot of the pressure off of you around content creation and the structure of the interview. You can reach out to Todd and let him know what you have in mind by emailing him at prosperityeconomics@gmail.com. Todd even has solutions to take the technology off your plate as well! 2) If you want an even easier solution to realizing some of the benefits of podcasting, consider coming on as a guest on our brand new podcast FOR ADVISORS called The Advisor Advantage! The Advisor Advantage is all about independent advisors sharing their wisdom, philosophies, effective habits, and of course their passion for building a successful practice. If you embrace whole life insurance and other sustainable financial solutions not subject to the risks and volatility of the stock market then we may want you to be ON the podcast! Interested? Simply fill out this very short form that will be forwarded directly to the show host and my very talented sister Tammi Brannan. Tammi will get with you and let you know if you will be on the show! As you can see, we are huge fans of using podcasting as a platform to both communicate with current clients and as a value-driven vehicle for reaching out to a new audience that we can help and serve. You’ll have to decide if podcasting is right for you and your practice. Hopefully you now have enough information and options to make a well educated decision.